The in-game UI and alert sounds don't always match up to your race. Your race is dynamically assigned to you within the game. The default UI and alert sounds are tied to your lobby race and cannot be dynamically altered. Getting around this limitation would take a titanic amount of effort for very little payoff. Teams are now warned about their time remaining to pick/ban. Textual warnings are given at 60, 45, 30, and 15 seconds remaining. Verbal warnings are given at 60, 45, 30, 15, 10, and 5 seconds remaining. Reserve time has been added. Currently, both teams are allotted 45 seconds of reserve time for picks/bans. The timers will show reserve time and current decision time added together (so 0:45 reserve and 0:45 current pick time together would show as 1:30). When the timer begins to dip into reserve time, both textual and verbal warnings are given to the team. The captain's selected unit is no longer cleared when switching between race menus. 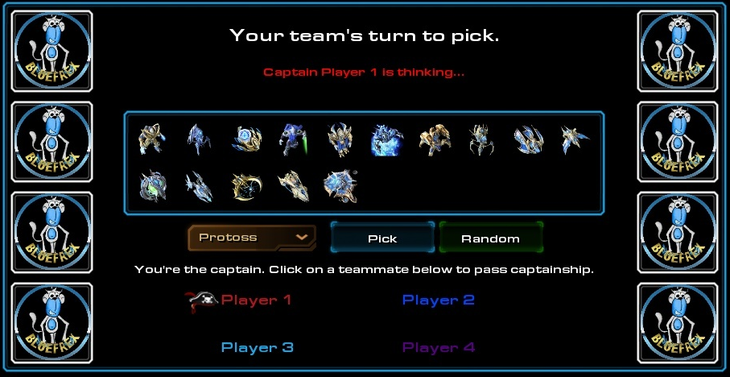 If the captain selects a protoss unit and switches to the zerg menu, he may still click the pick/ban button to pick/ban the selected protoss unit. The captain may click an already selected unit to deselect that unit. When a pick/ban timer runs out the game will check to see if the captain has a unit selected. If a unit is selected, that unit will be picked/ban. If no unit is selected, one will be picked/banned at random. New textual notifications have been added to inform the team whether they are picking or banning on their turn. This information is still visible within the draft dialog itself (near the top). The debug dialog will be disabled on all maps during update. Resetting banked statistics in an attempt to track down the bug causing negative losses. Sorry, but expect another reset soon if it persists. Any additional info or replays about this bug appreciated. Fixed a bug that caused the "No valid captain remaining, game ending" situation to happen when the last player on a team left after drafting had already happened. While drafting, the game will attempt to assign captainship to a player with experience instead of seemingly at random. While drafting, players who are not the captain of their team can vote to repick the captain. If all 3 team members vote, the game will calculate the next best captain. New default game mode for Map of the Week and Sand Canyon Redux: Vote Mode. Players are prompted to choose to play Blind Random, Blind Pick or Tier Draft. The Skinned Teeth achievement should no longer be granted erroneously (already live on EU). Player stats should be correctly loaded while playing draft mode. Any stat overwriting from playing a draft before this update is permanent, sorry. Players who have picked Medivac or Warp Prism can now load allied units. While drafting, the random button can no longer choose Warp Prism, Medivac, Mothership or Overseer while Picking. It can still choose to ban these units. All units are banned except for 9 selected at random. Warp Prism, Medivac, Mothership and Overseer are always banned. The remaining units can only be picked once. The Captain's Hat of Choosing is automatically passed to each player on each team so that each is offered a chance to pick. Players may still opt to give the captain's hat to another player during their turn. Players still select the unit that they will play after the drafting process is finished. Random Options now default to "Off" for all optional units. Melee unit generation will now occur during map load and no longer causes "game start stuttering"
Fixed a bug where Ghosts counted against the Terran building flight limit instead of Ghost Academies. Racial icons have been moved to their own box on the lefthand side of the selection UI. Additionally, the selected racial icon now glows. Team logos that only made sense during the Pro Team Random Monobattles tourney launch event have been removed. The Bluefrex mascot has replaced them. His name is Dasa. Explicit descriptions for each mode (Random Any, Protoss, Terran, Zerg, Custom Referee) have been added. Referee button has been removed. Instead, if Custom Referees are allowed, a racial button corresponding to the mode will appear on the left. Selecting it and hitting GO will accomplish what hitting the REF button did. Hopefully this prevents players from accidentally hitting REF. Observer tab hotkeys have been added to mimic the standard spectator hotkeys. For example, pressing D will bring up the Production tab. Pressing D again will hide it. The Production tab for custom refs now displays progress bars. WHOA. Nydus Worms added to the production tab. Precision for the income tab values improved. Implemented player camera following as custom ref. Spectator notifications added. When enabled, these will give a message to the spectator when a significant event occurs (nuke, nydus, etc) and creates a white ping on their minimap for the duration of the event. This should make finding the more interesting events in a 8 player game easier. Additional significant events will be registered to the notifications in the future. The Weilhart bot no longer spouts a message during observed games. This is because he now spouts more than just his one line and it might seem out of place during a cast. Bank verification is now performed when clicking the "GO" or "REF" buttons instead of during map init. Hopefully this prevents the scenario where a disconnected player has their bank file wiped. The Queen has made a (possibly temporary) comeback. She requires 2 food and has access to all of her functionalities. However, she's limited to 1 per base and cannot use Transfusion on a non-Queen, non-structure target. Win/loss statististics tracking should now be much smarter. Previous stats were wiped as a result. You should be notified in-game if your bank file is "corrected" (usually wiped) if your file has been tampered with or is out of date. There are several new rules to when stats can be recorded, but generally if you have 8 players, no computers, and everyone stays in the game it's a recorded game. Leaving after you hit Go usually counts as a loss. When players are choosing their units, the choices are now displayed visually in the upper left for teammates. A faded unit indicates the player is considering that unit. Win/loss statistics are now available in-game. Hovering over your own unit information will display it to you. Alternatively, you may type "stats" after hitting the "Go" button to have the same information displayed to you. Hitting the "Go" button will lock you into the game stat-wise. Leaving before being granted victory will count as a loss. Leavers should no longer stall the ready process. Seriously this time. Scout's honor. Melee initialization and instant creep generation are very intense processes. Having them both occur at the same time (when everyone is ready) caused significant lag on many computers. Instead, natural creep generation will be greatly accelerated for the first 20 game seconds. This should have no effect on gameplay, but looks pretty sweet yo. Terran building flight limit now only activates if the player controls no other grounded buildings. This is to allow the acceptable practice of using a floating building for vision on unpathable high ground for more than 5 minutes without micro. Maximum continuous unpathable flight duration shortened to 3 minutes from 5 minutes since the application is now more lenient. Players who choose Random Any now have the option to re-Random Any a single time before they confirm readiness. The fact that they repicked will display in their unit icon. If you find yourself playing on a Bx Monobattle map and find yourself experiencing an issue that you feel is probably a bug or an unintended issue that can be exploited, feel free to PM me a link to a copy of the replay and describe the issue in as much detail as you can. Thanks! There are already over a dozen Monobattle mods, why make another? You know, my group of friends only recently got into Team Monobattle games and they are hilariously fun already. We often play Klishu's version for several hours just laughing and having a good time by consequence of the ruleset, as told by Day. However, we've been slightly underwhelmed by the features and quality of the current Monobattle mods. Some people wish they could see whether another player randomed those marines or if he picked it on purpose. Another group might like to have a completely even chance at rolling any unit (i.e., zerg units individually have a higher chance of being rolled than the other races because there's fewer of them). A lot of people wish they could exclude Warp Prism from the random group. I'd agree with all of these critiques and more. You can squeeze more enjoyment out of any game if you try hard enough. What's are the differences between this mod and the others? - For one, it aims to be easier on the eyes. Some of the mods are very minimalistic and show an obvious lack of effort beyond the barest necessities. Not everyone will like the design, I'm sure, but we tried to make it a crowd pleaser. - Random means random. There's no 33% chance of each race, then unequal chances at each unit on an individual level. Race selection is done in-game instead of the lobby, making this possible. 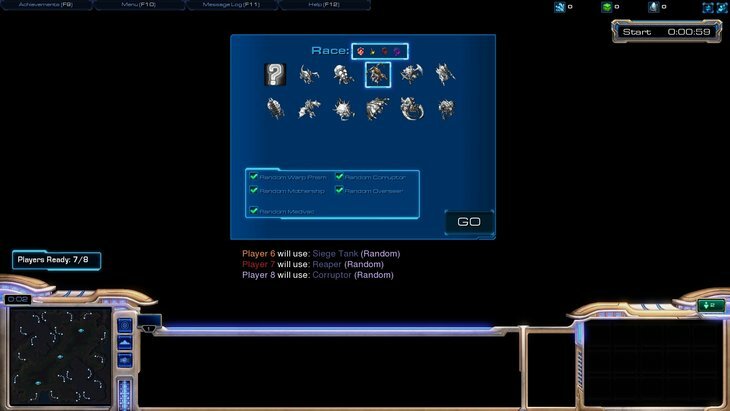 It is still possible to select a race but not a unit. - Modularity. Some of the available mods are not versatile enough to be useful on any given melee map (XvX, XvY, FFA). The Bx Monobattle mod can be plugged into any melee map within minutes. - Terran stalemates. 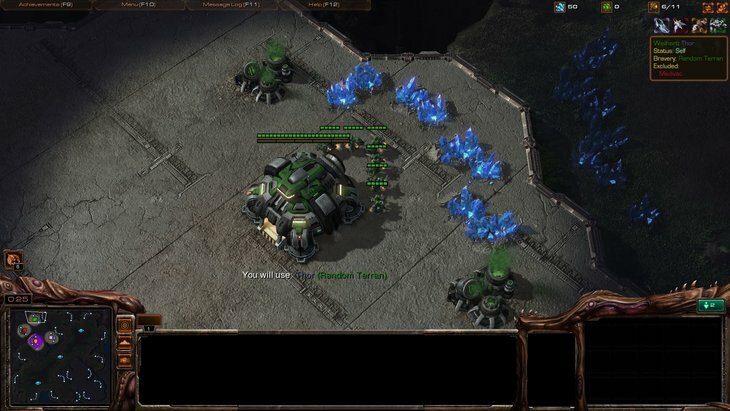 Terrans lifting off into a corner of the map can be pretty irritating on a monobattle map when you can't build any air to air units. To solve this, our mod limits continuous building flight over unpathable terrain/space while controlling no other grounded buildings to 30 seconds, shown to the player and his allies as a countdown on the building. After 30 seconds, the building is destroyed. - No starting stallers. Players are given up to a minute (tracked by a timer) at the start of the map to lock in their settings. Number of players ready out of total active players is displayed prominently, as well as the players holding the game up. - Settings memory. With greater options comes greater responsibility. The settings from your previous Bx Monobattle game are remembered via bank file and restored at the beginning of a new game, saving you and your fellow players time before the fun begins. All you have to do is press Go! - Bug fixes. Some popular Monobattle mods have important bugs that are hard to detect or even notice (mind you, Klishu's mod specifically has taken care of these and deserves kudos). Bugs such as excess Nexus energy and lack of creep/larva at starting Hatcheries have been solved. - Selection transparency. Team member selections are messaged to allies immediately and automatically. Player choices are prominently displayed during the game, marked by player color, and can show detailed information on the player's settings and choices by hovering over them. Additionally, the player details can be toggled to be shown or hidden if you don't like having each players' units displayed for the entire game. What are the special unit rules? High Templar - Archon Warp removed. Dark Templar - Archon Warp removed. Archon - High Templars and Dark Templars are unlocked when Archon is chosen, but their weapons and abilities are removed. Warp Prism - Cannot use Phasing Mode. Picking Warp Prism removes this limitation. Medivac - Cannot use Heal. Picking Medivac removes this limitation. Raven - Cannot use Auto-Turret, Point Defense Drone, or Seeker Missile. Picking Raven removes this limitation. Queen - One per completed Hatchery/Lair/Hive. Picking Queen removes this limitation. Overseer - Cannot use Changeling or Contamination. Picking Overseer removes this limitation. Baneling - Zerglings are unlocked when Baneling is chosen, but its weapons are removed. Brood Lord - Corruptors are unlocked when Brood Lord is chosen, but its weapons and abilities are removed. Is there a map up? Yes. The following maps are up on North America. If you're interested in hosting our mod on a different server, send me a PM. The following maps are available on EU. The following maps are available on SEA. How do I add this mod to my map? Request it to be uploaded by the correct uploader for each server. No guarantees. I can no longer allow the mod to be public or it'd overwrite bank file data every time someone switched authors. If you're organizing an event and need a specific map, you may PM me and I'll contact an uploader. - User feedback. As the mod sees more play, we'd like to improve it based on what you think. Can you publish it on other 4v4 maps? I've played megaton a zillion and a thousand times and wouldn't mind more variety in my monobattles. Anyone can publish it on any map, but sure. I can put up a few more maps. Got any preferences? This actually looks really cool and well thought out. If there are no bugs, this looks like a real keeper, gj! The only question I have that wasn't mentioned in the OP was, has the neural-parasited-worker -> full toss (or terran) tech tree issue been considered/addressed? I suppose you could argue that if you actually manage to pull it off in-game (especially the terran tech tree), you probably deserve to have it, but might be something to consider. Or perhaps just limit it to the buildings/non-combat units on the NP'd worker to stay in line with the spirit of the map? 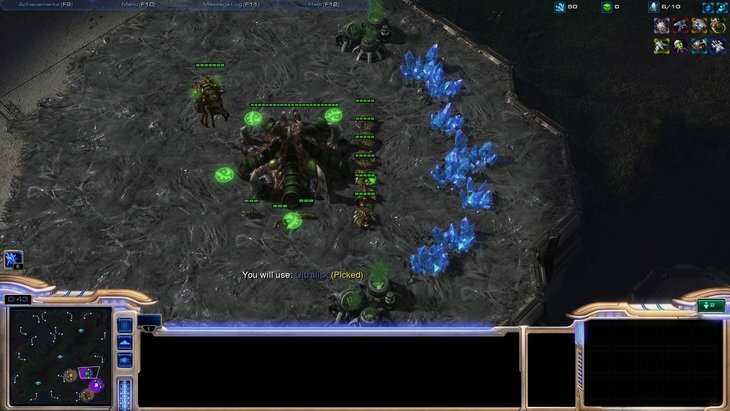 All tech is disabled for everyone, so NPing someone else's probe/SCV wouldn't be useful. If you've got a EU Starcraft 2 account, you can help. An upcoming Monobattle tournament has expressed interest in using the mod for their matches. If you're able to upload about 5 maps to the EU server and willing to do so, please shoot me a PM. PM'ed. Hope I can help. Changelog added and the public mod and five 4v4 maps have been uploaded to EU thanks to Chargelot. Updated the changelog in the face of the Phoenix upgrade. I fear not the shadows of glory nor the echoes of eternity; place before me a true rendition of greatness... and then we shall see. Er, yes. Actually, it's natively available on NA (since I'm on NA). 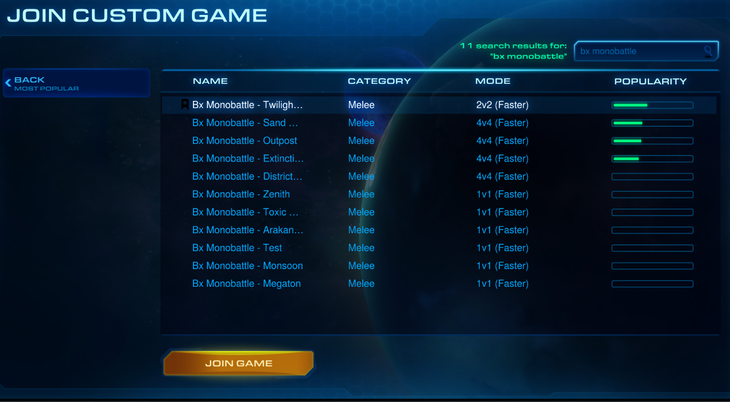 These should all be available in the custom game list by searching "Bx Monobattle" in Create or Join Custom Game. If you actually want to play them, I suggest bringing a couple friends together to try it out or you'll be fighting the lobby system (just make sure you press Open to Public before you start!). I personally checked just to make sure that they're on there for everyone and not just those of us who made it. Cheers. Bx Monobattle - Test is not a real map and is not public. Several of the maps are hosted on EU as well as the mod itself. You can add the mod to any map via the instructions in the OP so you can play your Monobattle any way you'd like. One critical feature that some monobattles map should implement is the ability to allow different selection rules. For example, what if we want to play where each player can select 3 different units? This should be fairly straightforward to implement, but would probably require a voting system, or a host system. I mean, picking warp prisms is great and all, but what's the point if you can't build gateway units to capitalize on phasing mode? "First decide who you would be, then do what you must do." there is one thing that have always bugged me about morphing units in monobattles, it has to my knowledge never happened butthe fact that it is still there annoys me, that is that if you pick a unit which is morphed from another unit (say, archon) then the first unit can be used. a giant ultralisk army is marching towards the base of an archoning player, the ultralisks will definitelly win in a direct confrontation with the archons (imagine 15 ultras vs 2 archons) but, in the last second the archoning player warps in 2 dark templars, places them on the ramp and putsthem in hold position. what does the ultras do? they cant get past, because there is an invisible wall there. now, the problem I am thinking about is not this exact situation, afterall, if the ultralisk player gets an overseer that will end the game in his favor. my point is that there exist areas in the game where you can effectively use units that should not be available to you according to the rules. zerglings and corruptors can be used for scouting, they shouldn't but they can. dt can be used for scouting and blocking chokes. ht... meatshield? no, ht are silly when they cant use spells, but my point stands. 1. make all units which can morph into something have a sightrange of 0. 2. remove the hold-position commands of such units. I'm better today than I was yesterday! There are more elegant ways to achieve what you're looking for, such as making an Archon ball trainable/warpable directly from the Gateway/Warpgate and skipping the middle man. But they make the game less interesting. 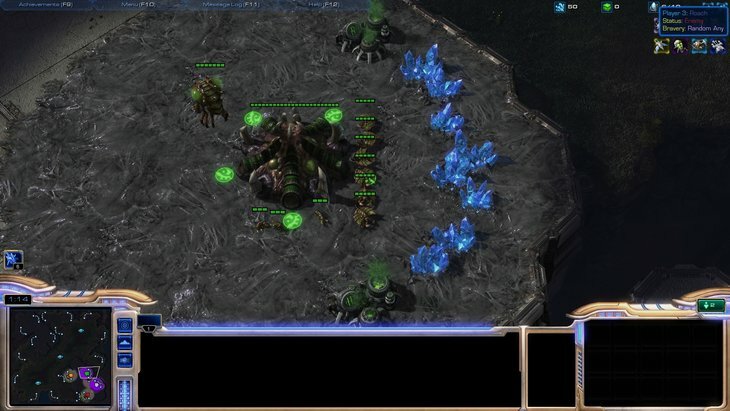 When a player gets Banelings they can do way more interesting things if they're allowed to use the fact that a Baneling is born a Zergling first. We even enable the Zergling Speed upgrade if you roll Baneling so that you can sneak or run by and morph in a base, or whatever you decide you want to do. In a game where his opponents might roll Marine, Zergling, Zergling, Zealot against his team's Archon, Ultralisk, Battlecruiser, Carrier I would be cheering on clever uses of disabled DTs against opponents who forget detection. This mod needs to replace the current one. The current one is SO outdated, it really needs this new stuff. I do thank you for the interest. The best ways to get a mod up in the charts are to play it "open to the public" with friends and to get it streamed by popular folks. I'm attempting one of these, feel free to attempt the other! The following updates will be rolling out today to make the Bx Monobattle mod even better, including a fully operational custom referee system that allows spectators to see both important spectator information provided by the default UI and information pertinent to the monobattle portion of the game. Initial stage of custom referees is implemented. To activate custom referees, create a private game and set the "Allow Referees" to "On", then set game mode to "Custom" and place referees on their own team. This unfortunately complicates the implementation of the mod on a map, but should still be easily achieved in under 2 minutes to those mildly familiar with the player and trigger editors. The guide to implementing the mod will be updated accordingly on release.